In response to overcrowded public schools in countries neighboring Syria, caravan schools provide refugees with free education to keep them from falling behind. ZAATARI, Jordan – In a tiny classroom in a metal trailer, the 11-year-old Syrian refugee writes his name on the chalkboard, practicing the letters of the Arabic alphabet he is just now beginning to learn. He was barred from the local public school because he didn’t have refugee documentation. Wearing a blue, hooded sweatshirt with a small hole in the sleeve, Salameh Saleh stands more than a foot taller than the other students in the crowded, dusty classroom. This is because Salameh is nearly four years behind in school. He should be in the fifth or sixth grade, but, due to the war in his battered hometown of Homs, Syria, he has only completed the first grade. His story is not uncommon here in the village of Zaatari in the northern part of Jordan, near the country’s largest refugee camp and a few minutes from the Syrian border. When Salameh’s family fled to Jordan from Syria’s grinding civil war a couple of years ago, he was barred from the local public school because he didn’t have refugee documentation. Instead, like many refugee children, he held a job. To help earn money for his parents and five siblings, he worked at a nearby tomato farm. The Syrian Civil War has driven more than 4.5 million refugees into neighboring countries like Jordan, triggering an education crisis that experts fear will blight the future of an entire generation of Syrians. The private school in Zaatari, located in a series of trailers that locals refer to as “caravans,” was founded two years ago by a Syrian refugee named Abu Sultan. The caravan school has provided free education for about 75 students each year, many of whom are undocumented like Salameh. It also provides dozens of documented Syrian students with a supplement to the bare-bones instruction offered at the overcrowded public schools. The school represents the way some refugees are developing their own solutions to this educational crisis, allowing students like Salameh to get back in the classroom. After writing his name on the board, Salameh crouches on the ground next to his classmates. He fixes his large brown eyes on the blackboard and checks his work carefully, making sure each letter is written just as his teacher instructs. Eleven-year-old Salameh Saleh practices writing his name on the chalkboard in Abu Sultan’s school. Salameh should be in the fifth or sixth grade, but, due to the war in his hometown of Homs, Syria, he is currently in the first grade. According to a UNICEF report released in March, one-third of all Syrian children have been born since the beginning of the five-year Syrian civil war. More than 300,000 of these children were born as refugees. Poor villages like Zaatari are now coping with the large numbers of Syrian students flooding their already troubled local schools. Due to its close proximity to the border and the refugee camp, Zaatari was one of the hardest-hit Jordanian communities. The population here has nearly tripled since the start of the Syrian war, mostly because of the influx of refugees. In Mafraq, the province where Zaatari is located, 35 percent of schools were overcrowded in 2014, according to one study. In an attempt to lighten the burden, Jordan’s Ministry of Education has worked with UNICEF and other groups to create double-shift schedules for many schools in the country. This arrangement provides classes for Jordanian students in the mornings and Syrian students in the afternoons. But the system left Syrian students in double-shift schools with little class time—sometimes fewer than three hours a day. “We realize that it’s not enough,” said Shorouq Fakhouri, an emergency education officer for UNICEF in Jordan. With classrooms congested, class time minimal, and schools far from home, many refugee parents don’t see the point. Some take their daughters out of school to marry them off or to help around the house, Fakhouri said. More often, though, families pull their children out of class in order for them to labor on local farms. An education becomes difficult to justify when a family can’t afford to heat its own tent. Two-thirds of Syrian refugee households in Mafraq province live below the national poverty line, according to a United Nations High Commissioner for Refugees report from July 2015. Nearly half have no heating, and 20 percent have no functioning toilet. Meanwhile, massive cuts to stipends from the World Food Programme have left refugee families more vulnerable than ever before. Across Jordan, nearly half of all Syrian refugee households said they rely partly or entirely on income generated by a child, according to a 2015 study by UNICEF and Save the Children. About two years ago, the Syrian refugee teacher, Abu Sultan, noticed another problem. Large numbers of refugee children, like Salameh, didn’t have the option to attend public Jordanian schools, either because they were undocumented or because they were too old. Students who have been out of school for three years or more are not allowed to attend a Jordanian school, Fakhouri said. This includes both Jordanian students and refugee students who stopped attending school back in Syria since the beginning of the conflict. In the countries neighboring Syria, including Jordan, Lebanon and Turkey, an estimated 700,000 Syrian refugee children are out of school, according to a UNICEF report. “It is a big concern,” Fakhouri said. Recognizing this dilemma, Abu Sultan decided to do something about it. Eleven-year-old Salameh Saleh is a first grade student in Abu Sultan’s school. He should be in the fifth or sixth grade, but, due to the war in his battered hometown of Homs, Syria, he is four years behind. Before fleeing to Jordan, Abu Sultan—whose given name is Ahmad Khalif al-Addad—worked as a math teacher in Homs for about 25 years. But when the violence escalated, his school closed, and his village became too dangerous for his family to stay. Joined by his wife and seven kids, Abu Sultan paid a smuggler, rode for eight hours in an open truck, and eventually reached the Jordanian border. Soon after arriving in Zaatari, Abu Sultan began noticing flaws in the local education for refugee children. He heard his own children talk about the jam-packed public schools, where the teachers were seemingly incapable of controlling the classroom. He also saw children loading into trucks in the morning, heading to the fields to pick olives or tomatoes instead of going to school. Seeing all of this, Abu Sultan’s first instinct was to do what he did best: teach. He started offering free math and Arabic classes to local refugee children in his personal tent in the village. His efforts caught the attention of a local organization, For Syria, and the group donated two caravans, two months of income for the teachers, and several desks. Another group, Dar Al Yasmin, which provides basic goods and extracurricular activities for children in the village, donated a third caravan and a month of income for the two teachers working alongside Abu Sultan. Since then, though, the funding has stopped, due in part to financial struggles within the organizations. The school’s teachers now are all working for free, Abu Sultan said. Abu Sultan reads a book with his daughter, Maiadah, in his tent in the village of Zaatari in northern Jordan. About two years ago, the Syrian refugee teacher founded a school in the village to provide free education for refugee students. A few miles across town, the bell rings to start the day at the Asma Bint Abi Bakr public elementary school. Hundreds of students shove and pull at one another’s backpacks as they enter the gates to the school property. In one third-grade class, 70 students pack into a classroom for a lesson on the Quran. Two students sit on the ground and three girls cram into a single seat. This is one of the more crowded classes at the school, where each classroom holds between 50 and 75 children. “Next year it’ll be even higher,” says the school’s principal, Taghreed Mahmoud al-Mashaqba. The school is one of many across the country that has adopted the shift system recommended by the Ministry of Education. The five-hour morning classes are for Jordanian students, and a few Syrian female students, grades four to eight. The three-hour afternoon shift is solely for Syrian students, grades one through four. Brawls are common among Syrian students, especially outside the gates, before class starts. Fakhouri surmises it’s partly due to the amount of violence these children have witnessed, both back in Syria and in the news. 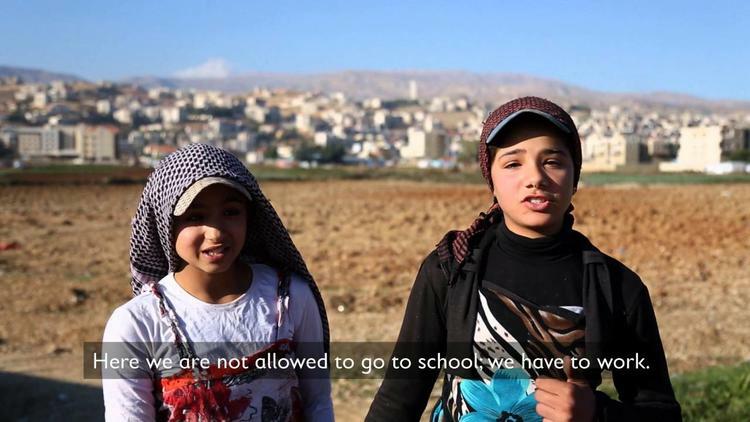 Nearly 600 Syrian students are enrolled in this school, and all are presumably registered refugees through the UNHCR. However, this number frequently fluctuates, al-Mashaqba said. “The problem with the Syrians is that they come and go, come and go,” al-Mashaqba said. One reason for this is the lack of a school bus to transport children to school. In the winter, children must walk several miles in freezing weather, often without proper winter clothing. Read the whole thing at Yes! This article has been excerpted and a link given to the entire piece.